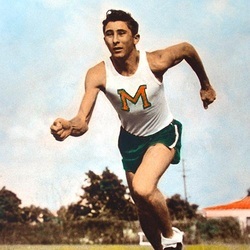 Considered one of UM's greatest middle distance runners, Earl Welbaum left UM as the school record holder in the quarter-mile (49.6) and half-mile (1:54.4) races and also ran the anchor leg on the mile relay record-holding team (3:31.0).Welbaum earned four letters (1951-54) and was captain of the team in his senior year. In four years of competition he was defeated only once at the 880-yard distance. In his first collegiate meet as a freshman he ran second in the quarter-mile and was not defeated again in the 440 until 1954 and it took a track record effort to beat him. Described by the school newspaper "The Hurricane" as the "Ironman", Earl would run whatever event necessary to gain points for the team. Many times he not only won both quarter and half miles, but he also anchored the mile relay and occasionally ran the mile as well. After graduation, Welbaum entered law school and returned to coach the freshman track squad in 1955. Earl and his wife Joan live in Miami and have three children, Karl, Michael, and Carrie.